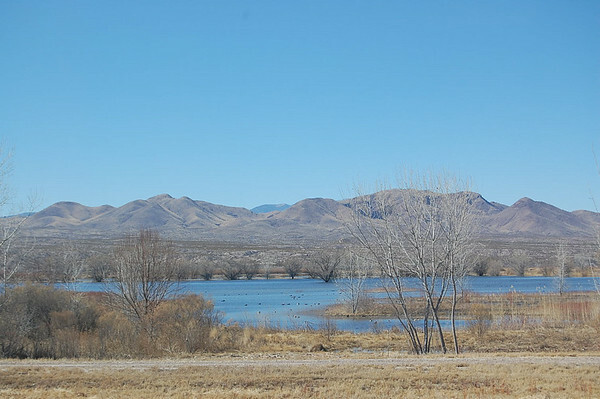 Today we visited Bosque del Apache National Wildlife Refuge in San Antonio, New Mexico. 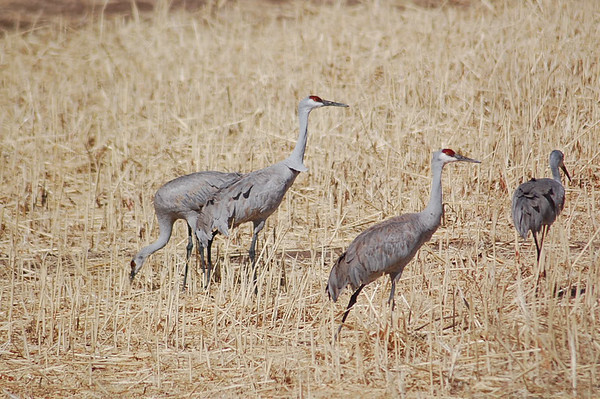 It is well known among bird-watchers. 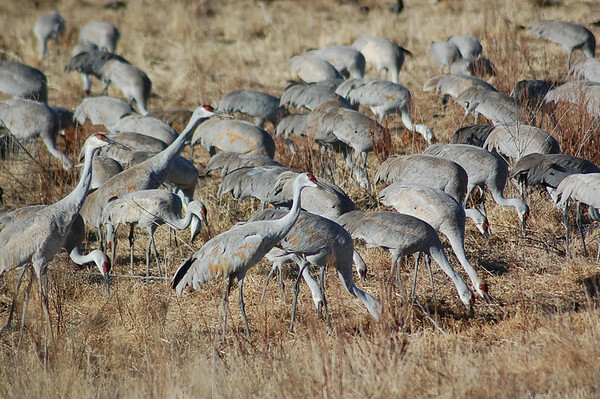 Just outside the refuge were fields of Sandhill Cranes. Once in the refuge, we didn't make it very far before pulling off the road to check out some waterfowl on one of the many lakes. 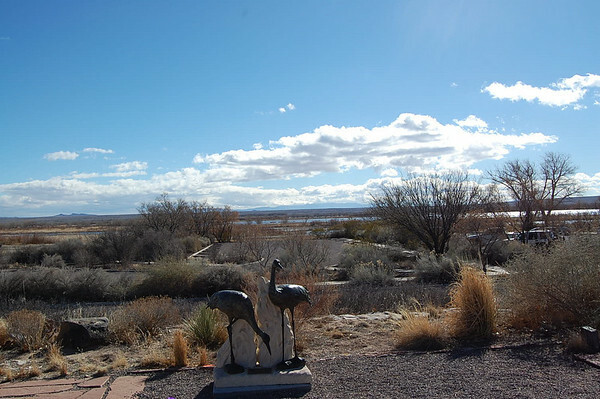 Five miles into the refuge, we came upon the visitors center. Wow! They sure have nice facilities here. As we usually do, we watched the movie about the refuge before getting started. We signed up for a guided tour and then purchased the $2.50 CD for the self-guided 15 mile auto tour. But before taking the drive, we walked around the visitors center area a bit. 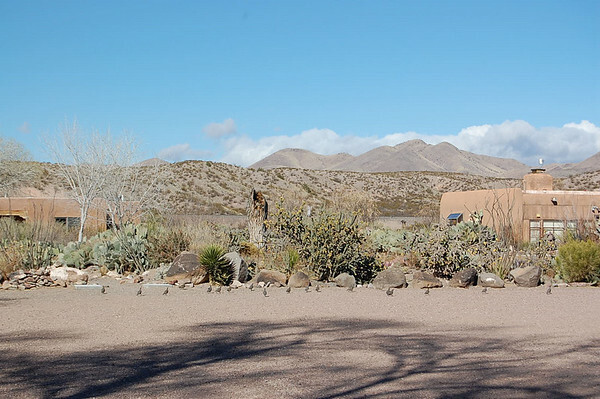 Those little dots above the tree shadows are bunches of Gambel's Quail in front of the cactus garden and staff residences. Here is one of the little guys on a rock. One last shot looking out over the refuge before going on the driving tour. 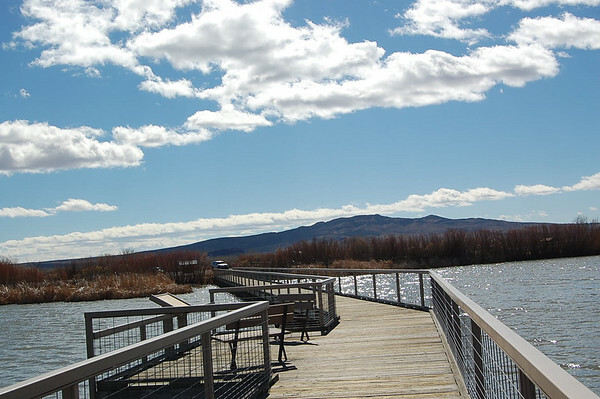 Out on the tour, we stopped and walked across the boardwalk trail. 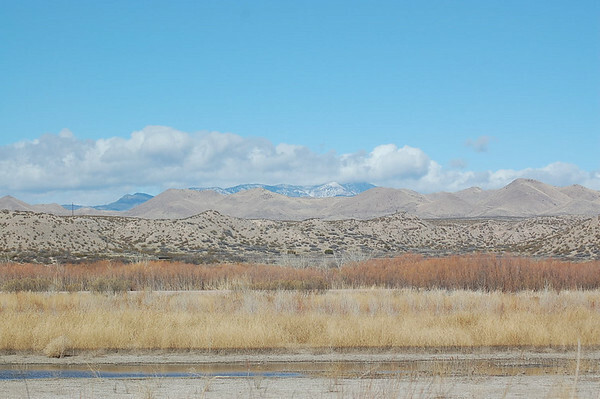 Here is a look at the Chupadera Mountains to the west with snow on the Magdalena Mountains behind them. 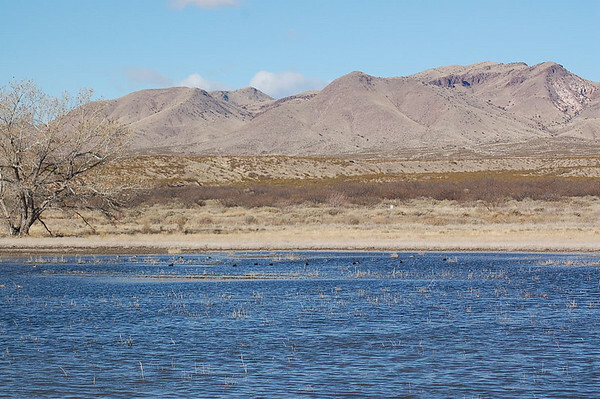 This refuge has lots of water which makes it a great habitat on this northern edge of the Chihuahuan Desert. 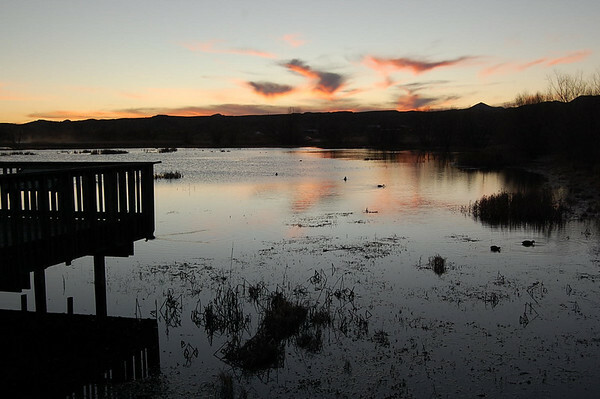 And all the water is managed since the water from the Rio Grande is siphoned off and no longer floods naturally to revitalize the habitat. 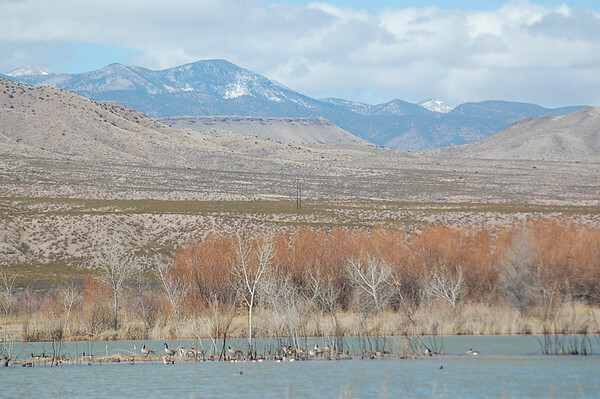 We saw lots and lots of waterfowl from a distance, but it was the views that made for the best photographs. 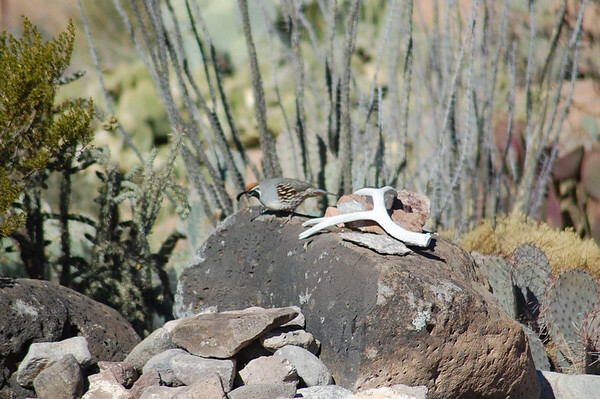 Okay, we got a few bird pictures. 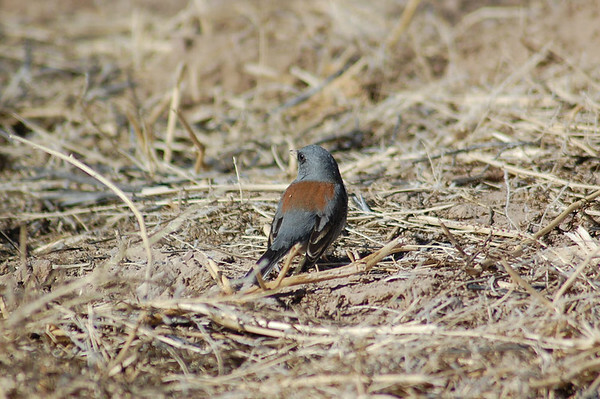 This is a Dark-eyed Junco. 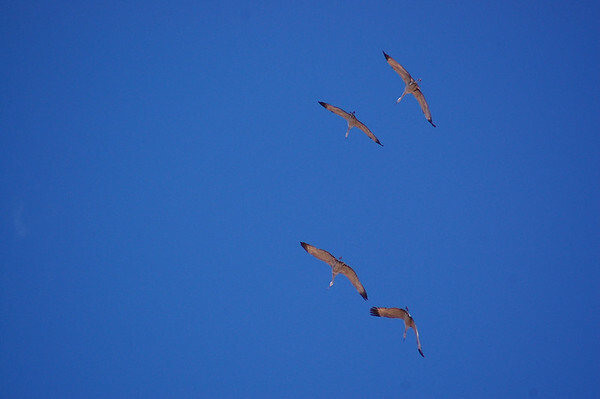 And here we have some flying Sandhills against the bright blue sky. 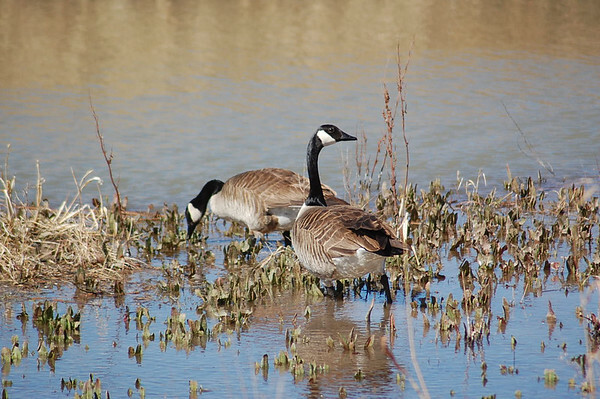 There are lots of Canada Geese that aren't too shy about being photographed. 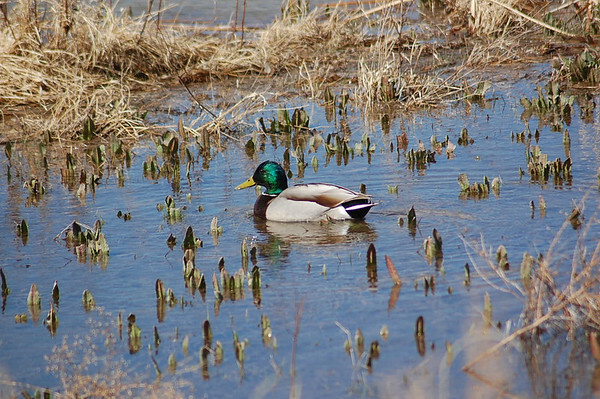 And neither was this gorgeous male Mallard. 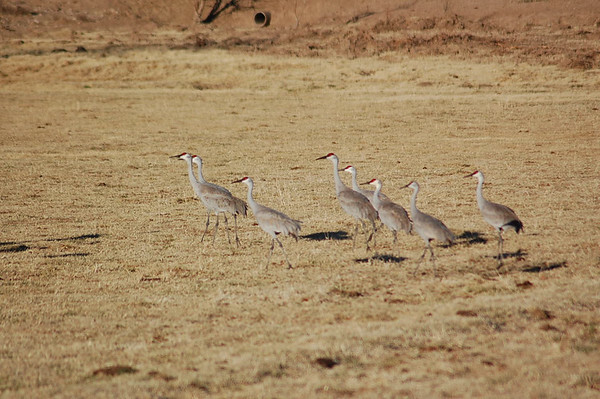 This Sandhill family was fairly close to the auto tour road. 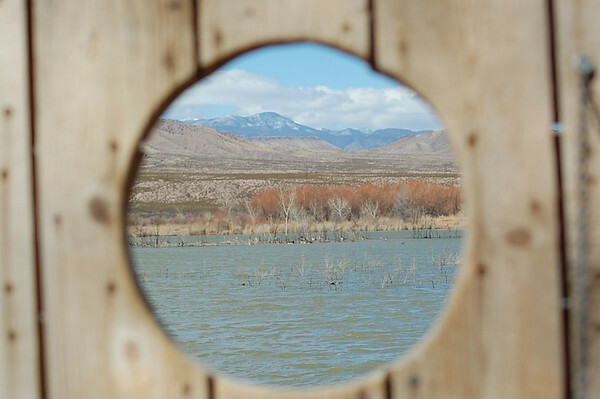 How about this view through one of the holes in the observation blind? 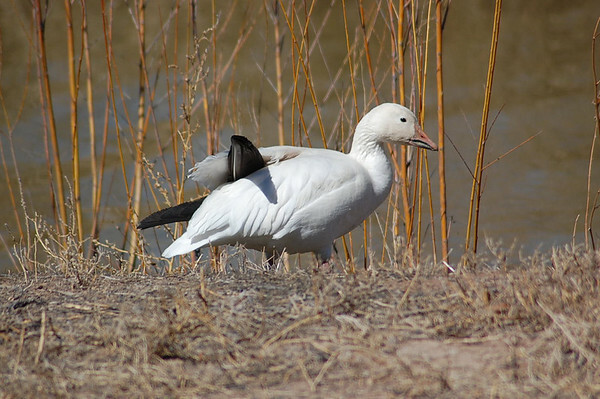 This poor Snow Goose is injured and couldn't migrate north with its flock. 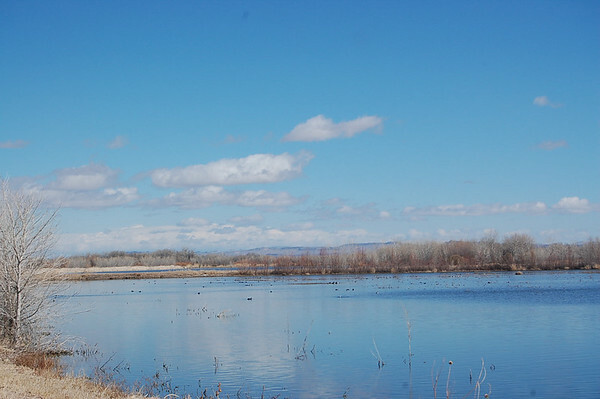 Only a few days ago, there were 50,000 Snow Geese at the refuge. We just missed the sight of them leaving. Now there are only about 300 left. 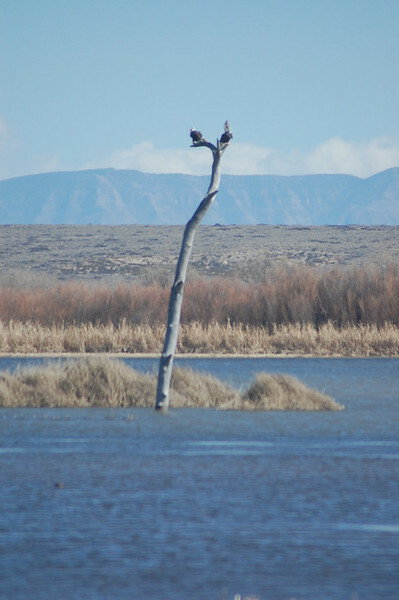 This is a pair of Bald Eagles on the dead tree in the middle of the lake. By now it was around noon, and Linda was worn out - she had been pretty sick. She had me take her home so she could get some sleep. 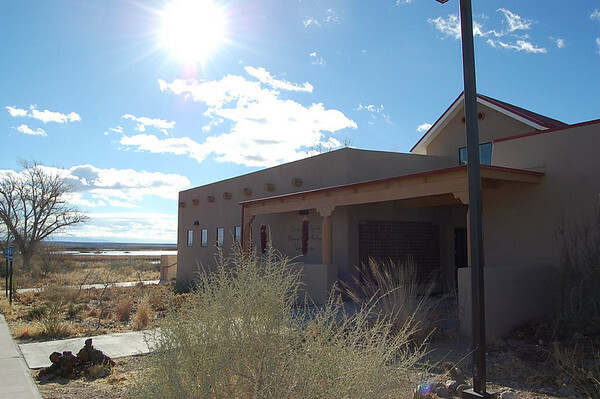 After dropping her off, I returned to the refuge for a 1:00 tour. The tour was of the same loop we just completed. But we did see more birds than we did the first time through. And the views were still great. 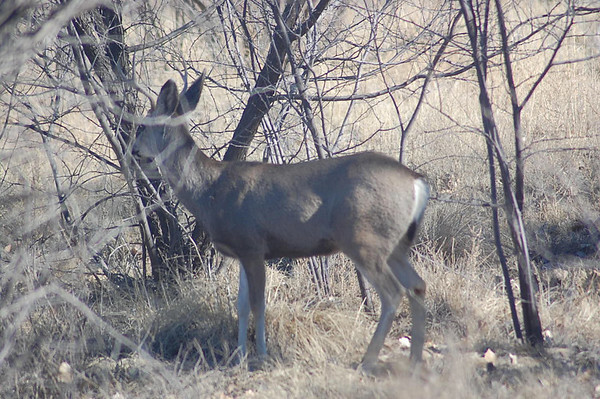 We also got a glimpse of some Mule Deer. The guided tour was nice, and Sandy, the volunteer, didn't try to rush it at all. She stopped the van for every sighting and backed up if necessary. 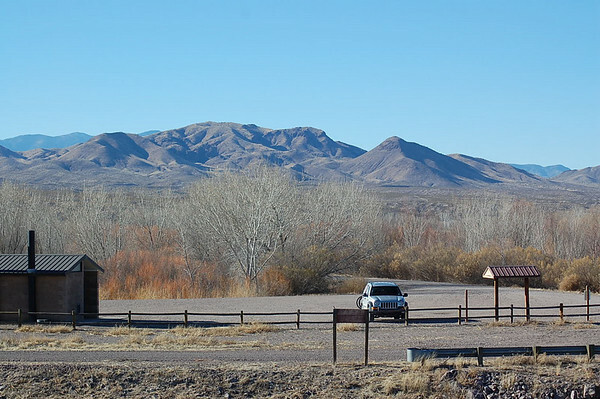 After the tour, I took the Jeep out to a trailhead to look around. 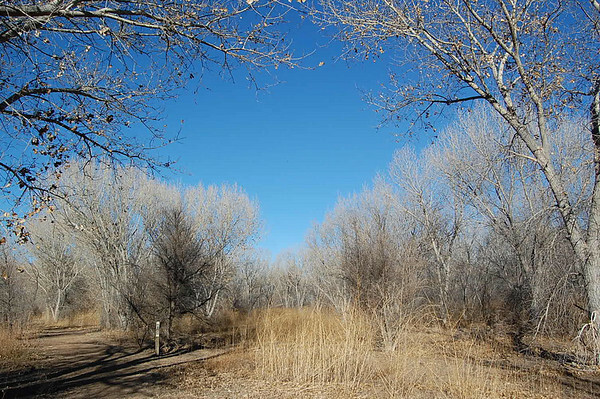 I took a walk around a two-mile trail loop. Not much to see though. Except for four Wild Turkeys that I couldn't catch up with for photos. 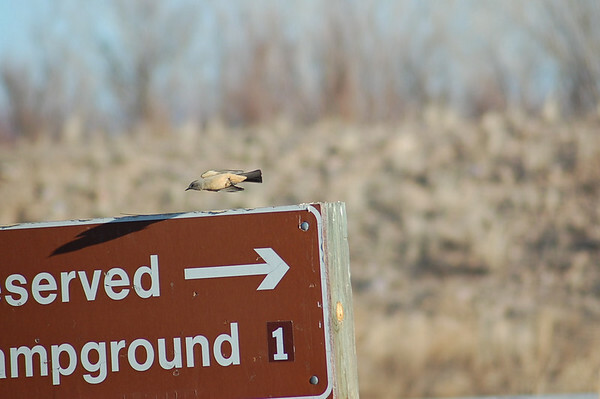 As I returned to the Jeep, I snapped a shot of a Say's Phoebe just as it took off from its perch on a sign. The result was this cool pic. It's flying sideways with its buff belly exposed. And you can see its shadow on the sign. Interesting. 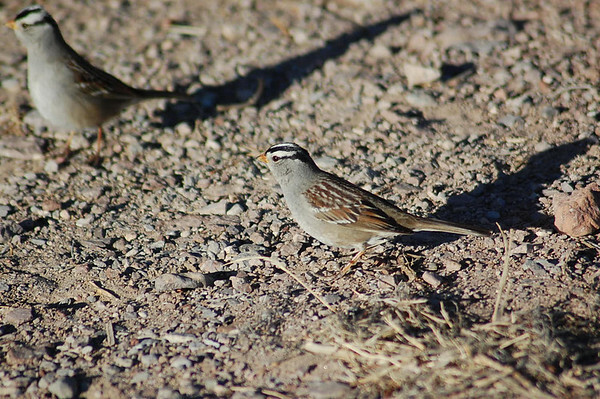 On the way out of the refuge, I made one more stop where I got another shot of the abundant White-crowned Sparrows. 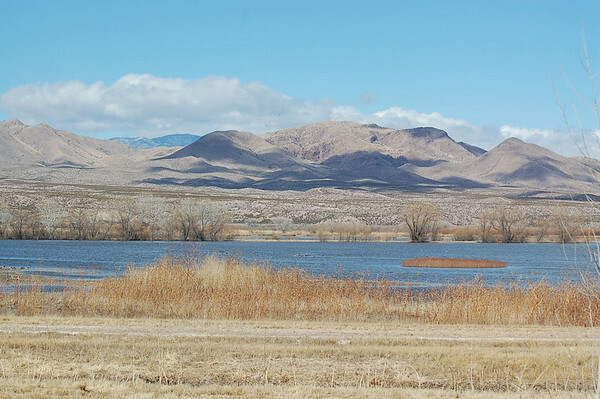 I stepped up onto an observation deck for this photo of one of the lakes and the San Pasqual Mountains in the background. 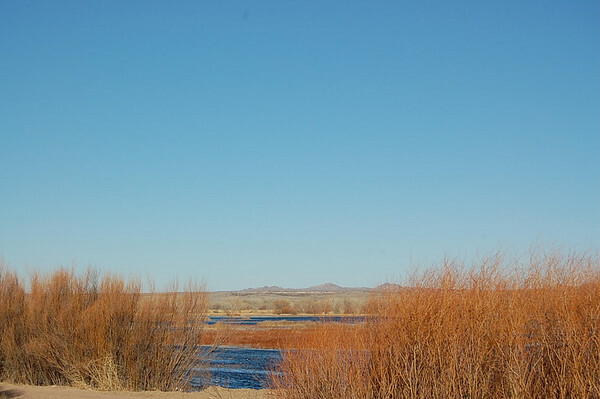 I thought this shot was kinda cool with the orange of the Coyote Willow as a contrast to the lake and sky. One last shot of the waterfowl before going home. 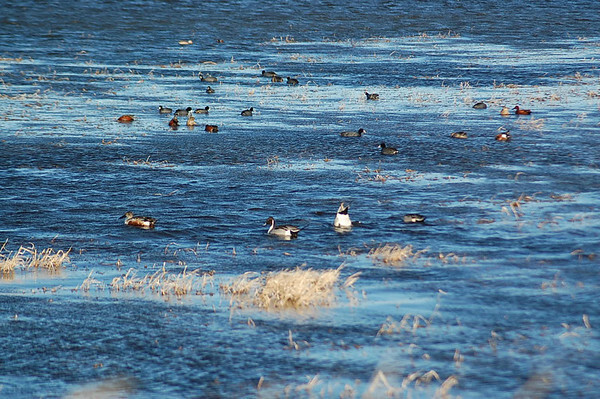 In this pic, we have Pintails, Shovelers, Coots, and Cinnamon Teals. Then I headed home to see how Linda was doing. Fortunately, she got about three hours sleep and was feeling well enough to go back to the refuge. 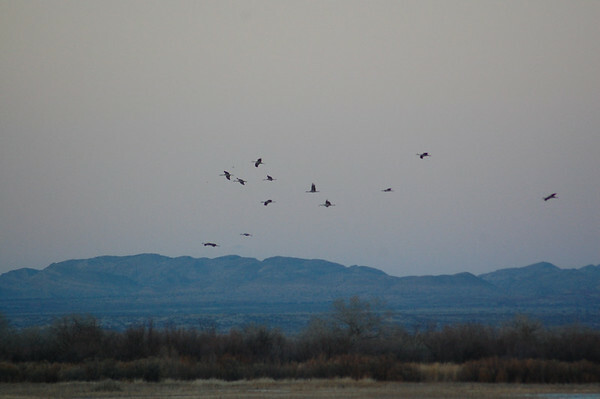 You see, in the winter, the Sandhill Cranes and Snow Geese leave the refuge at dawn to go feed in area fields. 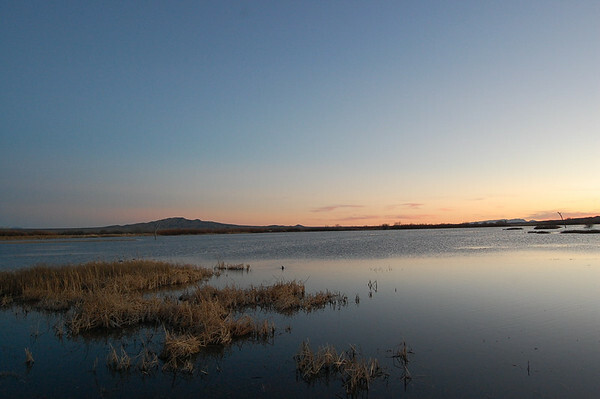 At sundown, they all fly back into the refuge where they sleep in the lakes for protection. 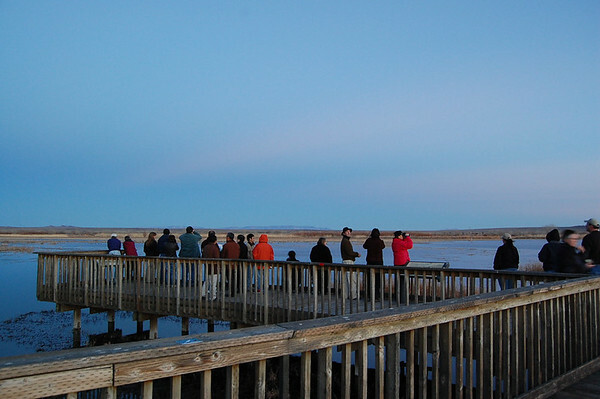 while folks lined the Flight Deck observation platform to watch. While everyone else was watching the cranes, I was taking pictures of the lake and colors of dusk. That was fun. It was one of those times when you just know you are getting a couple of memorable shots. After the sun went down, it started cooling off quickly, so we left. 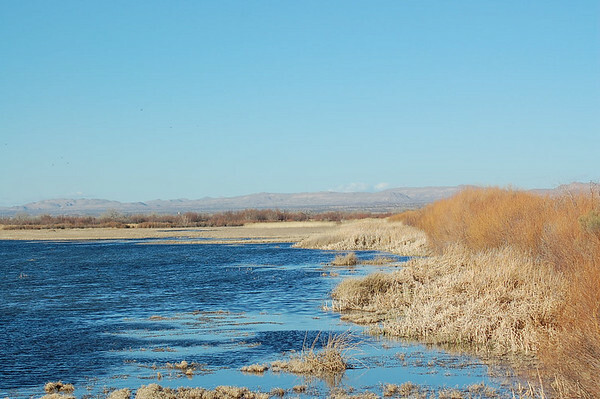 It was a great day at Bosque Del Apache. 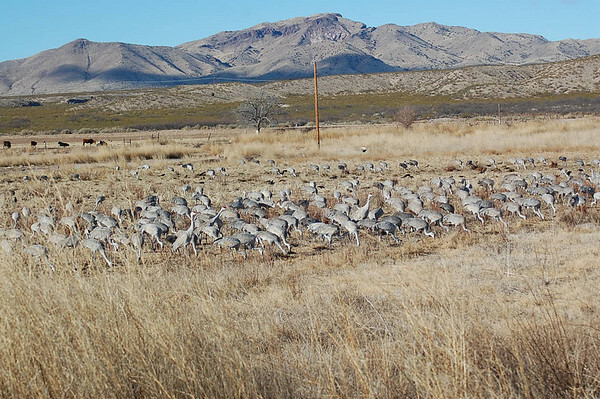 Forty species of birds plus Mule Deer and a Raccoon. Well worth the stop.